Born in Seville on 7th October 1949, lived his youth between Seville and Africa, experiences which had a significant impact on his pictorial work. He was awarded a Fine Arts degree from the “Santa Isabel of Hungary” faculty in Seville, became Professor of Drawing and has obtained, during his extensive career, a great deal of certificates in teaching, such as Flamencology, Technical Drawing didactics, Contemporary Perception in Architecture, Urban Planning and Landscaping, etc. 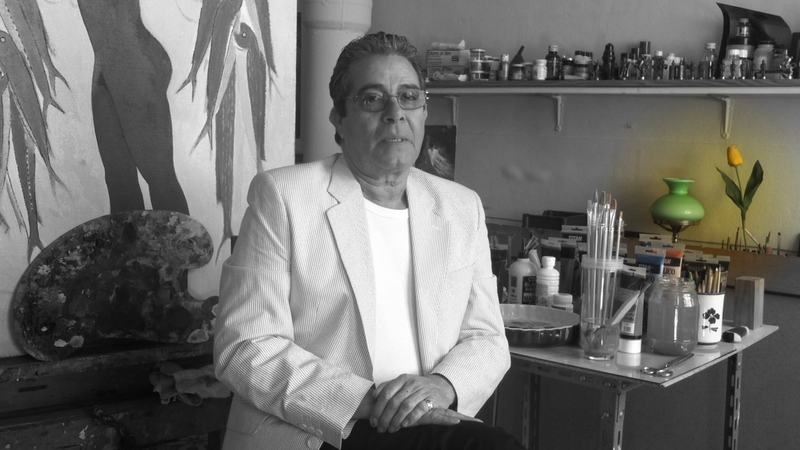 At present he is a honorary contributor at the Faculty of Fine Arts in Seville in the Department of Drawing. His Works can be found all over Spain, Europe, America (USA) and Asia (Syria). – III Sports in Art national competition, silver medal, when he was a student at the Faculty in 1976. – XXXV City of Carmona (Seville) painting exhibition Exposición de pintura Ciudad de Carmona (Sevilla), First Prize in drawing. – XIII Bollullos del Condado (Huelva) Cultural Fair, First Prize in painting. – City of Nerva (Huelva) painting competition, First Prize. – Coria del Río (Seville) painting competition, Second Prize. – Pozoblanco (Córdoba) painting competition, First Prize. – Pozoblanco (Córdoba) drawing competition, First Prize. – 1980. Poster for the Flamenco Club in Moguer (Huelva). – 1983. Poster for the Popular Festival in Nerva (Huelva). – 1984. Poster for Saint Benedict’s Festival. – 1985. Poster for the Cultural Week in Valverde del Camino (Huelva). – 1987. Poster for Carnival in Chipiona (Cádiz). – 1988. Poster for Carnival in Valverde del Camino (Huelva). – 1998. Poster for the Presidency of the Bull Ring in Seville. – 2001. Poster for the El Turruñuelo soiree, Triana neighbourhood, Sevilla. -2003. Poster for the Sottomundo Urbano 900 trio. -2004. Poster for soprano Alicia Murillo. -2004. Poster for Saint James and Saint Anne’s soirée in Triana, Seville. -2010. Poster for El Majuelo High School in Gines, Seville. – 1981. Al-Andalus Art Gallery, Granada. – 1983. Córdoba Savings Bank, Córdoba. Almería Art Gallery, Almería. – 1983. Valverde del Camino Town Hall, Huelva. Sala Oriente Art Gallery, Sevilla. – 1983. Fine Arts Museum, Huelva. Valverde del Camino Art Gallery, Huelva. – 1991. Gines Town Hall, Seville. Saint Gély (France). – 1996. Sala Imagen Art Gallery, Seville. – 1997. Los Venerables Art Gallery, Seville. Pablo del Barco Art Gallery, Seville. – 1998. Artana3 collectiva exhibition with the Aduana Cádiz group on anatomic figuration at the La Buhaira Community Centre, Seville. – 2001.Gines Town Hall, Seville. Besides the ones mentioned above, he has also exhibited his work in Jerez de la Frontera, Nerva, Salón de Otoño in Sevilla, Salón de Primavera in Sevilla, Peñarroya, San Marcos in Sevilla, Sala Claraboya in Valverde del Camino. His Works can be found in Germany, France, Italy, Syria, the United States and Spain. Outside of painting, he has done some research, including his discovery of a sculpture by Giuseppe Serpota, as well as a painting of an Infant Jesus by Zurbarán. He has also contributed in set design for the plays The Lesson and Antigone, and has produced numerous illustrations for books, such as those published by poets Ángel Caballero and Daniel Lebrato.